The time of year arrived again and it was time to point the nose of the aircraft due south, way down south to Tierra del Fuego. As usual we arrived in Buenos Aires on New Years eve, and the party we had in Puerto Madeiro is hosted exclusively for us and booked in advance. What a great way of starting a New Year for all the Global family. When we arrived in Rio Grande on the 2nd of January we found the river much higher than the year before, but its clear, and that will help in the search of the big, silver Sea trout. After a fantastic lunch we are all ready for the first days outing of our 10 days in Rio Grande. The tackle set up this time was to be a sinking tip at level T14-17 and the intruder flies are doing well, even if some fish are still caught on smaller nymphs fished deep. The river is running faster than last year and some of the pools that weren’t productive last year are now working well; Ken had 7 in an evening session on Confluenza. Laurence and Phil are soon cracking the code and catching big, nice fish. Phil with a 21 and 24 lber is again making his mark. Lars and Frede are starting strongly too, and Lars lands a nice 20lber on his single hand rod; this is not the last on the trip for him. Gerhard and Donny are starting more sedately than last year, but in the end both are doing very well and getting personal records with many nice fish landed. Tam Black from Glasgow Angling Centre, as a first timer – is doing really quite well under Anita’s excellent coaching; they had a great time together. I can tell after watching all the smiles as i filmed them for the video we produced they both got a lot out of the trip. Ken and Nigel are full of enthusiasm as sergeants and did well as expected. Ken, together with Phil, are top rods for the trip with 31 fish each, Nigel is not far behind though. The two most dedicated anglers Nic and Stuart seems to be at the wrong place at the wrong time almost every day, fish are caught above and below them, but dead slow at times on their beats, thats fishing Nic said, after being top rod last year with 51 fish… But they both ended up with some decent fish in the end. We were all thinking about Per who had to stay home due to illness two days before daparture, but its only 11 months left till we head back. The food and service in the lodge was awesome this year, and the special barbeque at the Estancia was a great event. As is normal when we are away, we had fun! Many ”straffe ones” were bravely borne, and bottle after bottle of excellent Argentinian Malbec wine were enjoyed in the lodge. The guides are fantastic as always, the motivation they give us during the fishing days was supreme. Thanks to the hosts Alessandro and Filipe for having us, and to Lisa for hosting another fantastic trip. The flight from Anchorage to Bethel took 90 minutes and when we disembarked from the plane we headed across the tarmac to the smaller aeroplanes that were waiting for us. After a short 25 minute flight we arrived in Quinhagak. The guides were waiting with the bus where we left for the river, and after a 20 min boat ride up the river we arrived in the comfortable camp. We were allocated comfortable 2 bedded tents with wooden floors and and heater if required. Every day the tents were cleaned and the beds was made up whilst we fished. The camp serve some fantastic locally sourced food for breakfast and dinner; the lunch we make ourself and bring in a cooler on the boat. The Kanektok River is made for flyfishing. The guides are provided with aluminium boats with water jet engines to transport us around safely and efficiently up and down the river system. The guides have extensive knowledge of the river and are very skilled flyfishers. They tell us what to use and how to present our flies to our quarry, whether Kings, Chum, Dolly and Rainbow Trout. These make up the bulk of the fish we catch, but some Pinks and Silver are also a possibility during the week. We had 400 hookups of Kings, with a 42lber, the biggest landed by the talented Yves. Chum salmon; there must have been way over 1000, even great sport on dryfly, biggest 16lbs. Some great sport for Rainbow with a dry mouse fly was something everyone had to try; awesome action. We will be back, year after year, what a great place, staff and camp, thanks all. Looking forward to amazing sport when we return. The first group had a fantastic week, but it started windy with tough conditions on the flats. But the 2 last days gave us some trilling moments were Nic, Morten and me landed some big Tarpons between 120-130lbs. Anita and Peter had also great sport with Tarpons and Jack hitting the flies. The seccond group got some tough conditions to cope with nearly all week. 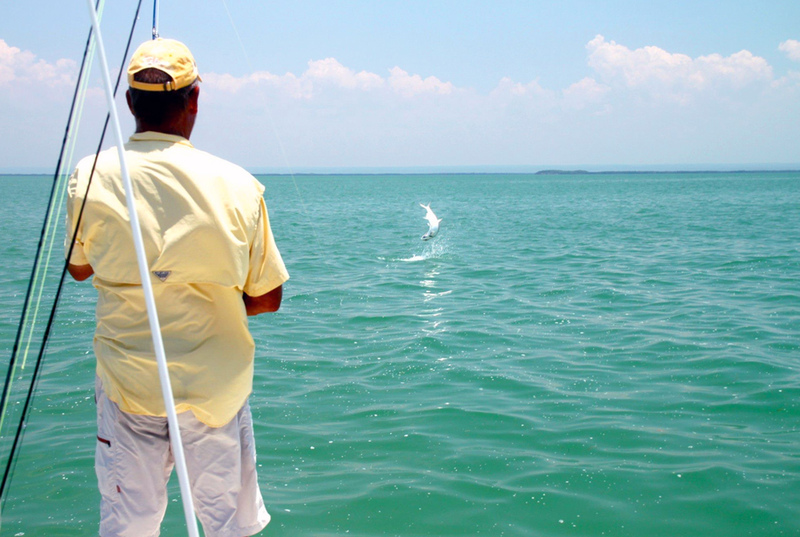 Paul and Phil was doing well chasing Groupers and Cudas, but for the rest of us we had a hard time on the flats. Nils got his first Tarpon ever and Gisle and me was hooking them but lost 10-15 to the boat. Morten and Atle had action too, but the wind was what keept us back every day. Great bunch tho, and most of the time we was fishing for Bones and Jacks wading the flats on the white sand. The groups arrived to a river that was falling after a spring with high, cold water. The first week we saw the nature around us changing and getting in to full spring all over Deeside. The salmon started running the river in big numbers, but the first week they did not stop in the pools. The seccond week in the upper part of the river we found the pools full of fresh, nice springers. We was fishing high in the water with smaller flies catching fish after fish. The top rod was 10 fish from Rolf with the biggest of 20lbs. Thomas also had a great day visiting us for a few days, 4 fish he put in the book on the Wednesday. Glen Lui Hotel provided us with a fantastic setting and great food as always, we will be back in 2013. The group arrived with the morning flight from Buenos Aires and was as normaly welcommed by the guides from the lodge at the local airport. The 30 min drive to the lodge gave us some info regarding the condition in the river. The first real number of fish had start entering the river a fortnight ago, but the water level was lower than normal for january, so the advice was nymphs in size 10-14, but the bigger flies when it got darker in the evening. Sinktips on a floating line was the best to use together with shorter double hand rods and single hand rods. The first evening showed us that this year there was bigger fish in the river then normal and Nigel landed his biggest ever on 24lbs. During the first couple of days all had landed fish and during the stay the top rod came up in the fantastic catch of 50 fish. The weather was changing as normal during the 10 days, but only one afternoon with tough wind, but it gave in and ended up with a calm evening. Temp from 10-18 celcius gave us all kind of clothes-change, from jumper to t-shirt. The guides did a superb job and together with the staff and kitchen showed that EMB is one of the best lodges in the world, thanks all. The rookies: Per and Donny picked up the fishing very fast and both ended up in personal record, times three. They also learned the thumb game due to the games harsh “straffeones”. Greath company and hope they will be back. The regulars: Anita and Morten started off as normal. After one hour I was visiting them in the pool and Anita had landed two, and lost one. She was going on like that all week. Morten had the groups highest average with 15lbs, well done champ. Nigel and Shaun was as alway doing well, but I was watching Shaun losing 5 fish in a row, his nemesis this time…but still heg ot over 40 fish on the bank. Nigel was leading but got beaten the last evening for the biggest fish, nest done Nigel. Lars and Sergey was goin on in their own way. Lars with only his toothpick and Sergey with all his scientific testing of flies, both landing many fish. Paul and Gerhard is the two nicest guest you can get, with a big smile on their face all the time, also when they was loosing fish, big fish, many times during the trip. Thanks boys. Top rod: Nic had the fantastic achevement of landing 50(!) fish for the trip. He got half on a size 14 green nymph on his wee double handed 6 weight rod, super. Biggest fish: Phil did it the last evening. At 9pm he landed a magnific fish on 32lbs, the biggest fish on all my 12 trips to Argentina, gratulation. Thanks all for making this a superb trip, look forward to next year already. The revenge of the fisherman’s, part two. After a tuff trip to the Island next door in February, we arrive to Cayo Coco and some record braking things will happen. The group from Norway is teamed up with two Glasgowers and a Dane. Paul and Phil had a trill during the whole week catching everything with gills and many of them were BIG. Paul told me that next year they will bring wire, thick wire, as a leader after been broken off so many times. Morten and Atle was searching for Tarpon on deeper water, they was in contact many times and they were shaken and steered after seeing a school of more than 50 fish average 100lbs. They also both got their first Bonefish ever, well done. Henrik and Nic were doing the same as Peter and me, searching for Tarpon on the flats. Both Henrik and Nic hooked up and landed some big Tarpons, but were unlucky with the places the two best days when Peter and I had a ball. Peter hooked up at least 15 fish one day, but landed only one. Broken leader and flies coming off was the name of the game, tuff and ruff fishing. I lost on the Thursday a fish up to 150 lbs after 1h20min, it took a 200m run and jumped 2 meter in the air, gone. The day after Peter and me had a double hook up and landed two Tarpons before the monster took the fly. A 4/0 black and red was attacked in the surface by a silver giant that took us to the limit before we manage to touch leader after 3h40min fight, look at the film. Fantastic week at this paradise island and a superb stay at Melia All Inclusive Hotel. We will be back many times next year. 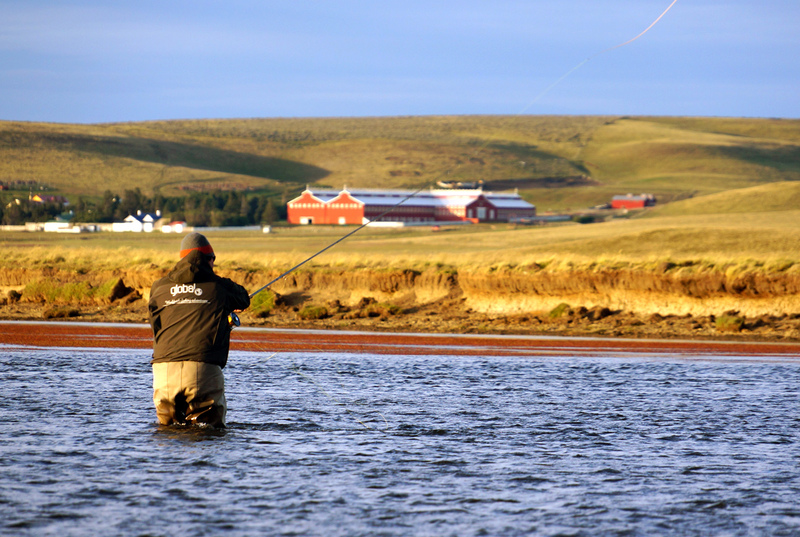 15 fisherman’s arrives in the lodge of Maria Behety and find the river in peak condition. So far this season the run has been slow, but a week before the fish has started to show up in the pools. We have 50 km of water and a lot of pools to fish, but the first days we focus on the lower beats to meet the fish. The river is high, but clear, so we are using small tubes or rubber leg nymphs. Most of the guys have been with me before and know all the tricks in the book and one after one the big sea trout are landed the first days. Fish up to 20lbs and bigger see the net and even after a few days we know this will be a record fishing for the lodge. The British team with Phil, Nigel and Ken is doing very well catching fish even on dry flies. Sergey is the Russian fishing machine and together with Lars from Sweden having great time too. The Vikings from Norway has 2 nice women in between them, nice in the lodge, but mean in the river. Anita and her daughter Charlie ending up with 24 and 25 fish and Charlies 22,5lbs is a split biggest fish of the week between Håvard and Phil. Gerhard, Arild, and me has been there before, but never seen so many fish in the river and we all have a great time. The two brothers young Herman and Claus joined up with their friend Alex is here for the first time, but still landing a good number of fish. The good fishing even made old Herman quiet for a vile, but it did not last for long. Old Herman, I will pay for that. The food and service in the lodge is outstanding as always and the Argentinian wine is superb and holds the same high standard as the guides. We ended up with more than 600 sea trout for the 10 days, well done and we will be back next year, nearly all of us.